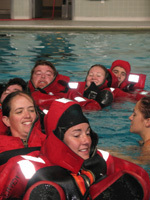 East West Technical Services LLC is a woman-owned, family-operated marine service provider based in Connecticut, USA. EWTS management has over 40 years combined experience working in the dynamic environment of commercial fisheries. EWTS knows the rigors of at-sea life and has first hand experience on trawlers, scallop vessels, clam dredges, longlines, pound nets and trap vessels. EWTS is knowledgeable in all the challenges and unique aspects present in working in the commercial fishing industry. 2002 approval from ACOE to provide DMIs and ESO to dredging contractors. • In 2003, EWTS was contracted by NOAA Fisheries Service to monitor sea turtle interactions with pound nets in the Chesapeake Bay. • In 2006, EWTS was approved by NOAA Fisheries Service as an Observer Provider for the Industry-Funded Sea Scallop program in the Northeastern United States. EWTS collaborates closely with the fishing industry and government agencies to deploy observers when vessels are selected for coverage and to ensure that predetermined observer coverage rates are met. EWTS maintains and adheres to all NOAA protocols and procedures and emphasizes high caliber performance by administering post-trip interviews with captains and crew to assess observer and inspector performance. EWTS currently manages over 20 fishery observers. • EWTS has hundreds of deployments a year for ESO, DMI, and Fishery Observers from Massachusetts to Virginia. All personnel collect data at-sea using specialized software and data protocols to prepare the data for final reports to be utilized by the appropriate agency (i.e. NOAA, the Army Corps, etc). • EWTS also specializes in at-sea electronic software development. EWTS has designed software to monitor Hazardous Analysis and Critical Control Points (HACCP) and Sanitation Standard Operating Procedures (SSOP) for use by the seafood industry. At-sea quality control technicians electronically monitor these protocols using software developed by EWTS.